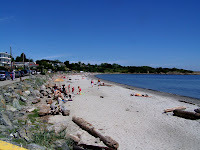 There are a lot of beaches around Victoria but none quite so popular as Willows Beach in Oak Bay. During the summer months people flock there to play, swim and sun tan. The water is shallow and if you are hearty you can swim there. With water temperatures of 8-10 C, you might even consider it very cool indeed. A lot of children swim there because no one has told them it is cold. There is a great playground there and public washrooms as well. During the spring and summer there is a concession/tea room open as well. If this place is too busy for you there are lots of beaches where you will be much more alone. Just follow the shoreline and check them out. There are a number along Dallas Road and some great ones on the West Shore such as Witty's Lagoon, Albert Head, and Esquimalt Lagoon.